In case the lack of new phones or software updates didn’t already clue you in, Microsoft has shut down any efforts to keep Windows Mobile 10 alive. On Twitter, Microsoft’s corporate vice president for Windows Joe Belfiore stated that the company is no longer actively developing new features or hardware for the platform, and that he has even switched over to an Android phone for his personal mobile needs. For anyone who has followed Windows Mobile for any length of time, it should come as no surprise that the reason for this shift in strategy is Microsoft’s inability to lure app developers over to Windows Mobile, which led to a barren mobile ecosystem that’s light years behind Android and iOS. On top of that, the lack of app diversity also caused many third-party phone makers to shy away from Windows Mobile, which meant there weren’t a lot of options when it came to buying quality Windows Mobile hardware, either. In recent years, Microsoft made an attempt to woo enterprise customers with features like Continuum, which let high-end Windows 10 Mobile phones like the Lumia 950 and HP Elite x3 double as a desktop Windows PC on a limited basis. But because those devices were expensive and still constrained to the handful of apps in the Windows Store, they too failed to catch on. Instead, it seems like Microsoft’s new strategy is to port over all of its big apps and services to Android and iOS. All of the major Office apps are already available on both Google’s and Apple’s platforms, and just last week, Microsoft released an Android version of its Edge web browser along with the newly branded Microsoft launcher (formerly Arrow Launcher). 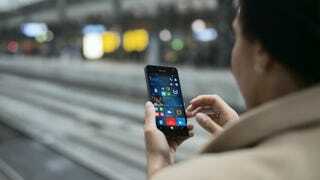 For people or businesses still using Windows Mobile 10, Belfiore said Microsoft will continue to support those customers with regular bug fixes and security updates. But don’t expect anything more than that. However, just because Windows 10 Mobile is on life support, it’s probably still too early to say Microsoft’s long-rumored Surface Phone is dead, too. Most rumors and reports indicated that the Surface Phone wasn’t going to come out before 2018 at the earliest and if it takes Microsoft a little longer to figure out what the company is going to do on mobile, that’s probably a good thing, because if Microsoft messes up again, the entire idea of Windows on mobile may truly die.